What date did you join the WI? When was the first time you came to Denman? What were your first memories of Denman? I was fairly young among quite a few older members; everyone was very kind and welcoming. There were no tea-making facilities as there are today, so, I volunteered for tea duty which entailed delivering tea to the first floor. As tea maker, I’d use the first floor pantry and would have to go along the guest rooms looking for either a ‘tea’ or ‘no tea’ sign which would be hung on the door! This duty was only supposed to last the first morning before handing it over to somebody else, only, I didn’t have the courage to ask anyone so carried the tray for the duration of my stay. What was the first course that you did at Denman? Modern Poetry, Novels and Plays. We were given a reading list and were taught by guest lecturers – many of which were academics, often from Oxford. There were a lot of arts courses, which I found especially interesting having come from a background of the sciences! Anne Stamper, Rigmer Evening WI, East Sussex Federation. 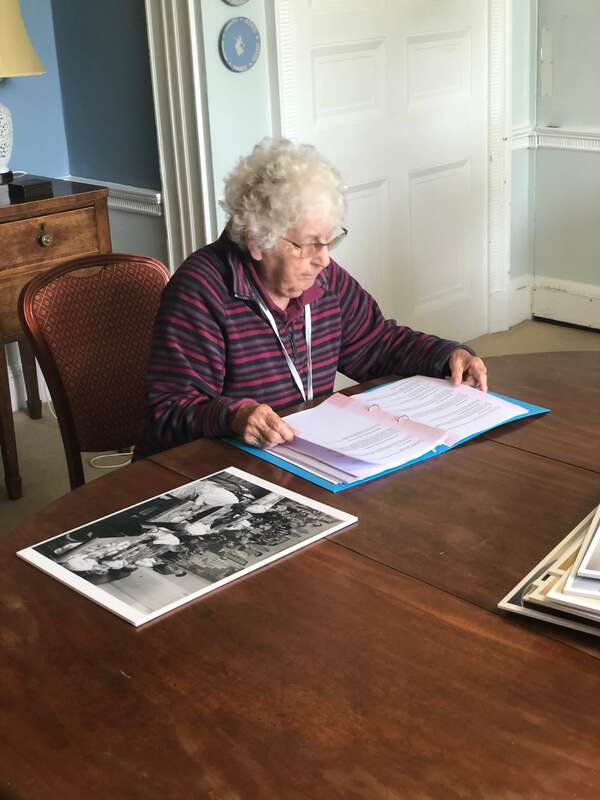 Pictured here at Denman preparing the Platinum Exhibition. How did you get involved with the Denman archive? 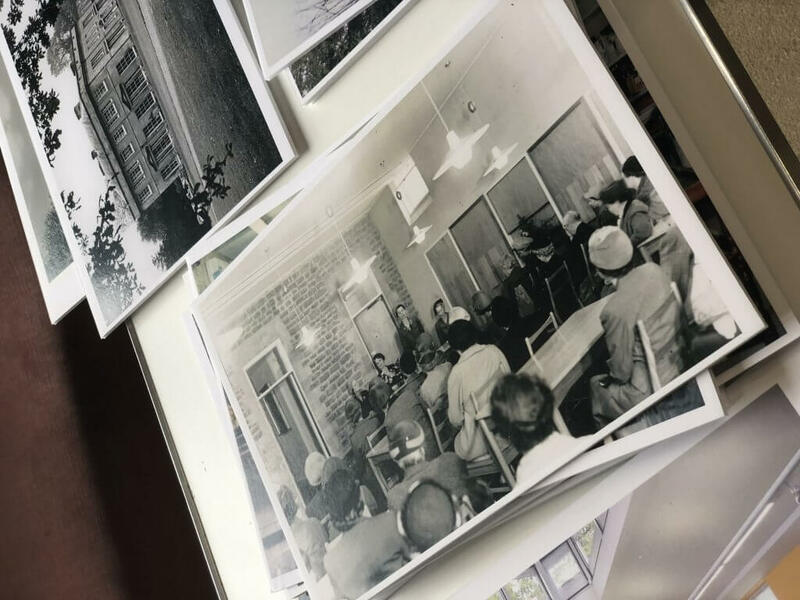 I was asked to write a book to celebrate the 50th Anniversary of Denman – which later became Rooms Off the Corridor, a history of adult education in the WI. This was to be a “proper” book and so I asked for access to the archives in order to research it. You can imagine my surprise when I found that the archive, back then, was just a few cabinets with next to no organisation and accessibility! Of course, I felt something had to be done. Having proposed the need for a Denman archivist to the Denman Management Committee and Board of Trustees I was entrusted with this. 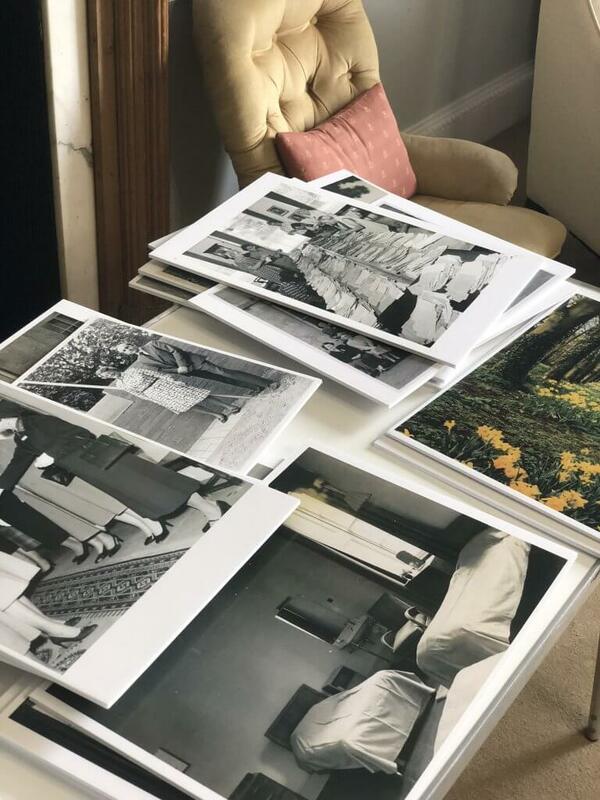 What is your favourite piece in the Denman archive? Mine is actually a tape recording! 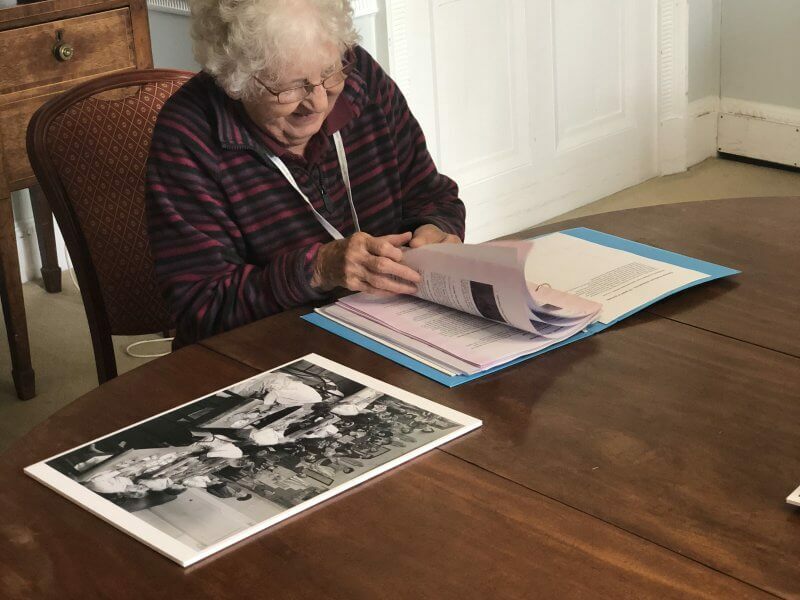 It includes Helen Anderson Warden in discussion with Hilda Jones and they’re both remembering a time at Denman when the teaching centre was being built. I believe this was recorded in the 80s. It’s so fantastic hearing them both speak together… it really brings the Denman story to life! What are your hopes for the future of Denman? I hope that Denman is always available to people. To begin with, there were other colleges offering a similar programme to Denman, but, these have gradually closed and now its just Denman holding the candle! I believe that there’s a real place for what Denman has to offer. Of course, the NFWI itself is registered as an educational charity and Denman ensures that its educational objectives are met time and time again. What are your hopes for the future of the Denman archive? It should definitely continue in the interests of the wider community. In terms of research and access, our archival material is an extremely valuable resource. We would not have been able to put on this exhibition without the store of photographs! Even committee minutes and the like can provide a telling insight into our shared history, goals and aims. The archive is especially useful in answering the questions that are asked. It’s the historian or archivists duty to field these questions and find the answers! Most importantly though, people continue to send stuff in! This needs to be preserved. So many identify with Denman and, sadly, archives often get forgotten. In order to gain expertise in an area, informative material needs to be kept safely. Not just for posterity, but also because, now, especially, there is a growing awareness to the importance of archives. We need to do everything we can to raise the profile of this important area of work. Can you describe the exhibition for those who haven’t visited yet? Come and see Denman in 70 years of pictures. Most of these are unpublished and haven’t ever been seen! I hope that people will either think “gosh! was it really like that? !” or reminisce happily back to a time when students helped with the washing up!